Dissertation fellowships will be awarded in a national competition administered by the National Research Council (NRC) on behalf of the Ford Foundation. The awards will be made to individuals who, in the judgment of the review panels, have demonstrated superior academic achievement, are committed to a career in teaching and research at the college or university level, show promise of future achievement as scholars and teachers, and are well prepared to use diversity as a resource for enriching the education of all students. 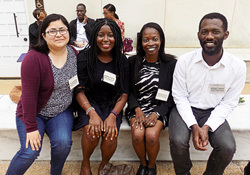 Access to Ford Fellow Regional Liaisons, a network of former Ford Fellows who have volunteered to provide mentoring and support to current fellows. All citizens or nationals of the United States, nationals, permanent residents (green card holders), and individuals granted deferred action status (DACA), regardless of race, national origin, religion, gender, age, disability, or sexual orientation, studying in a research-based discipline, are eligible.